A delicious blend of fortified white wine, orange and spices. One of the great traditions is the aperitif – the time to relax, reflect, watch the world go by and prepare your taste buds for what is coming up next. We are thrilled to put a distinctly Australian flavor on the aperitif. CORRELL, named after our vivacious mother who, like us embraced this wonderful tradition, is made from a secret blend of fortified wine, orange & spices. We recommend serving it chilled, over ice or in a CORRELL cocktail, in the company of family & good friends. Enjoy CORRELL responsibly. Wine based aperitif. Correll was the third daughter born to Connie & Arthur Jackson of Rutherglen. They were delighted to have a healthy baby but had been hoping for a boy. Not having chosen a girl’s name, they gave the nursing sister the honour of naming their bundle of joy. The rest is history! 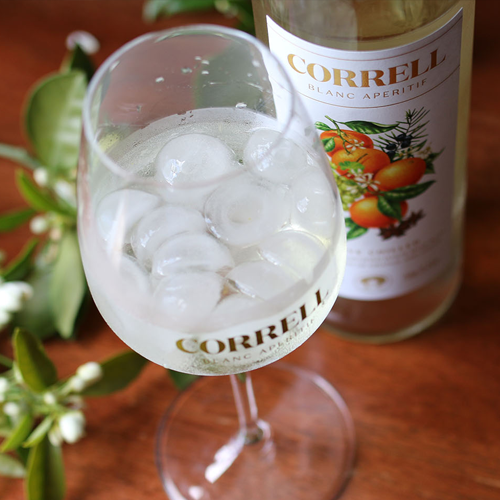 CORRELL is a wine-based blanc aperitif made from a secret blend of fortified wine, orange & spices. 18.0% Alc. Vol., cellaring none. Enjoy it chilled, over ice, as a spritzer or in a CORRELL cocktail, in the company of family & good friends. Pour the CORRELL Blanc Aperitif, gin and vodka into the cocktail shaker. Add the ice. Shake vigorously for 8 to 10 seconds. Pour into the glass using a cocktail strainer. Squeeze the orange peel to release the flavour and place in the glass. Combine all ingredients in a jug and stir. Strain off ice and then garnish with the orange peel twist. Combine all ingredients in a jug and stir. Strain off ice and then add fresh ice garnish with the orange slice. Pale yellow, almost colourless. The aromas are fresh and vital and led by bitter vermouth herbs and citrus notes including grapefruit and lemon. The wine is fully sweet and again intensely-flavoured with bitter herbs - like an Italian vermouth, except that it's not dry. A very appealing flavoured wine, which would be best used as a mixer, although I could imagine enjoying sipping a small glass over ice. "Pretty in Pedro - Inspired by winemaker Mandy Jones's time in Bordeaux, learning how that region's famous Lillet automatised wine is produced, this is gently sweet, pretty white infused with orange rind, star anise and juniper. Serve chilled over ice." "Rutherglen's Mandy Jones, of Jones Winery & Vineyard, has perfected a French-style aperitif wine that is light and aromatic.....There's a background sweetness and the warming sensation of 18 per cent alcohol. Add the naturally aromatic character of grapes grown in the Rutherglen region and you get a distinctively Australian aperitif."